Of all microcomputer inamorati, Atari owners probably take game programs most seriously. They are jaded; it's tough impressing the crowd for whom Star Raiders is invariably among the first programs ever booted. They expect more. Their machines, after all, were designed by games experts and exhibit advanced gaming capabilities. These capabilities are only now being fully explored, and are evolving, by leaps and bounds, into an art form. Games offer an interactive and involving means by which to demonstrate strides in color graphics and sound synthesis. In the process, they afford a great deal of creative freedom to the programmer, not to mention hours of fun for the player. Still, a majority of Atari owners do not consider games mere frivolity. A swiftly growing market attests to this. This has led to at least two identifiable results: an explosion of third-party software, some showing real promise, and translations of first-rate Apple programs for the Atari. We shall examine several of these here. I should provide a little background concerning this program, as it has an interesting past. Toward the end of last year, I reviewed a version of Protector written by Mike Potter and released by Crystal Software. The review, which appeared in another magazine, took the program to task for a number of flaws, "quirky bugs," and disappointing features. This was unfortunately true of the Crystalware version, and ruined an otherwise promising game. It was mysterious to me why an inspired program employing sophisticated techniques should be released in such a state. The reason surfaced early this year, with the release of Protector from Synapse Software, Mr. Potter's new employer. It seems that when Mr. Potter left, his old company decided to market his as-yet-unfinished program. The Synapse version, I'm happy to report, not only corrects all the faults of the earlier version, but includes several new features, and to top it off, costs less than its predecessor. Needless to say, steer for Synapse Protector and away from any other. The game is one of the most polished efforts I have seen from a third party source. It is exceptionally dramatic in its graphics and sound effects, and the animation is mirror smooth. A great deal goes on in Protector, and mastery of the game requires a substantial amount of time. 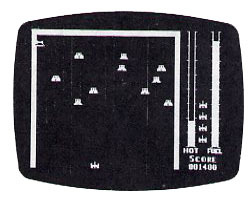 The game is roughly modeled after the arcade game Defender. As the pilot of your rocket fighter, you encounter pulse-trackers, meteoroids, laser traps, a volcano, an evil alien ship, and 18 people in desperate need of your help. You must maneuver your ship so as to airlift these people from their beleaguered city to the City of New Hope, and from there to safety in an underground fortress. You must act before they are heartlessly dropped into the volcano by the tractor beam of the alien ship, and before the volcano erupts and destroys the City of New Hope. You must also watch the fuel tank--and sometimes face the decision to refuel or to save some lives at the cost of your own. You can not always do both. By far the best thing about the game is the horizontally scrolling terrain graphics. The overall goal is to create a "microworld" --a fantasyland one screen high by four or five screens long. Fine scrolling and player/missile techniques are employed to very pleasing effect. For demonstration purposes alone, this program is worthwhile. Sound effects add much to the illusion, and the title music is quite good. The feeling of flight is accentuated as you dive to the rescue. Time ticks off as the indestructible alien saucer beams the victims up. Pulse trackers nudge dangerously close. Careful when you return fire: their favorite trick is to get you to hit innocent bystanders. If you get all the remaining people to the City of New Hope, you can then move them through the laser field toward your goal. You must then watch for laser bases and meteoroids. When fuel runs low you must return to base to refuel. Docking can be a tricky and sometimes fatal task. The game is paced into six levels of difficulty, graduated to present more aggressive aliens and more complex architecture through which to navigate. The merest graze of scenery, pulsetracker, meteoroid, laser fire, or tractor beam, and you go down in a dizzying spin. An ambulance shoots out immediately to drag you away--what's left of you, that is. Better luck with your next ship. I have very few reservations concerning Protector. As soon as a level loses its challenge, you may advance to the challenge of a new level. The highest level is very tough indeed. You may get a little tired of hitting things after a while, but after all, that's your own fault, right? Next time, be more careful. Mr. Potter has also created a children's game which will keep many adults busy after the kids have been tucked in. Chicken may be played with a joystick, but the responsiveness of a paddle is recommended to really rack up a score. 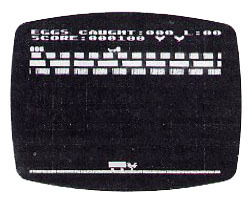 Conceptually close to the arcade game Avalanche, the object is as follows: you, as chicken, must catch in your cart all the eggs dropped by a fox scampering across the top of the screen. If you miss an egg, it hits the ground and cracks, and a peeping chick appears. As a chicken, you must fight back the instinctual urge to sit on the eggs you drop--an understandable but annoying habit. The trigger allows you a fluttering leap over the chicks in your quest to catch more eggs. This may sound somewhat bizarre, and in fact it is. But it is also guaranteed to bring a smile to your face as well as to the kids' faces. As rounds progress, the action becomes more and more frenetic, with laughter as result. A recent competition among adults play-testing caused a bout of hysteria. It felt very good. If you do plop down on a chick, a huffy farmer strides across the screen and gives you the boot. The addiction level is high, and the game is refreshingly violence-free. By the time you have caught 40 or 50 eggs, your reasoning powers are on the wane. Ever hear the term "twitch game?" This game may be its namesake. There is a dumb problem with Chicken, but it is worth mentioning. In an effort to make the game playable with stick or paddle, only one controller port is used. This means you must pass one paddle between players. This is by no means a major complaint, it just makes the game a bit less than it might be. The graphics and sound in Chicken, like those of Protector, are superlative, complete with barnyard music, the plop of dropped eggs, the peeping of chicks, and the fluttering of wings in a futile stab at flight. I've had an opportunity to learn about Mr. Potter's latest work, now in progress. I've promised not to spill a word, but I will tell you it sounds incredible. If I can get my wife to stop playing Chicken, I'm likely to take another shot at Threshold, which probably stacks up as the best "Galaxian-style" invaders game to date for the Atari. Atari owners will happily note that Threshold has been translated from the Apple, and that OnLine Systems is in the process of translating many of its popular Apple programs for the Atari. Also, new translations of best-selling Apple games are now available: Apple Panic, Raster Blaster, and Crossfire, to name a few. The translations of these games are at least as good, if not better, than their original versions. Threshold uses player/missile graphics, and Raster Blaster makes use of multi-channel sound. Threshold is in the venerable tradition of laser-fire space wars (kill, kill, kill!) and it is superb. The alien waves in this game are ever-changing and wonderfully despicable. Your ships are armed with lasers and hyperwarp drivers that can temporarily slow down time, giving you a better chance to target the enemy. Your arsenal has limitations, however. The lasers can overheat and will shut themselves down until sufficiently cooled. You may invoke hyperwarp only once per ship, and each ship has a limited fuel supply. As for maneuverability, have you ever had the misfortune to be driving a power-steered vehicle that stalls while you're driving? That's the way the stick feels in Threshold. The line between utter frustration and total addiction is a thin one, and this game rides it well. The game is hard to play but you can improve a little with every game. 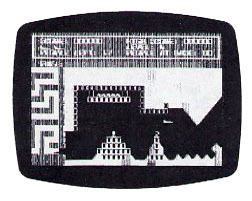 Aliens swoop down at your ship from the top of the screen, and each wave has its own character, its own "look." Some fly in jittery formation, others billow like a flag in the breeze. Your natural inclination to gape at them will prove fatal unless curbed. Discipline is called for in order to concentrate not on their grotesque beauty, but rather on their ability to destroy. If you manage to survive a number of successive waves, you dock with the mother ship, which is rendered with the humor of a Saul Steinberg cartoon. Here you are refueled while a new set of nefarious alien waves are read from the disk. I have managed to live through two sets so far, and have yet to reach "the last wave." The documentation promises that when you get there, you'll know it. You can choose to play with or without a moving star background (which makes it much harder to see enemy fire). You can also choose a horrific advanced level. Threshold will obsess you for some time. Because the aliens change throughout the game, you're primed to withstand at least one more wave this time." Though my wife abhors "shoot-em-ups," even she spent a while with this one. After quite some time, I still have no reservations about Threshold. Mouskattack is a maze game that has a personality all its own. It moves beyond John Harris's earlier creation, Jaw Breaker, which set a standard for quality in Atari game animation. If maze games appeal to you, so will Mouskattack. The game has several unique facets. Rather than "eating" as you traverse the maze, you are a plumber, laying pipe as you go. You are zealously pursued by a group of multi-colored rodents whose goal is to snuff you out. They have you on the run, so even after you have traversed the entire maze, some of the pipes may need to be reworked. Your only assistance in the completion of this task consists of a couple of traps, which don't hold rats for too long, and a couple of cats, who are too scared to do much more than discourage them a bit. Mouskattack is tough. I don't care how experienced you are at any other kind of maze game--this one will pose a challenge. In fact, familiarity with other maze games may actually be a handicap! Mouskattack requires an entirely fresh approach. The ultimately disappointing thing about many maze games is that the player can master rote winning patterns. Because the "enemy" follows the same patterns every game, routes can be learned which will work each and every time to avoid confrontation. In Jaw Breaker, Harris foiled the possibility of rote patterns by making the "enemy" much less predictable. In Mouskattack, he provides a new element strategic opportunity. Traps and cats can he picked up and moved in the course of your travels through the maze. This capability allows experimentation leading to strategic configurations. This is much more engaging than beating Pac Man with maps. The option makes you feel that more is involved than just conditioning and reflex action (though those qualities will certainly help your score). The animation is very well executed, though lacking the inspiration and sparkle of Jaw Breaker. There are some flourishes, however. When you are "tagged" by a rat you drop down the screen like a leaf in a fall breeze. Every so often a "super rat" appears (easy to spot--watch for the "S" on its chest). Super rats will eat your cats right out from under you, so you must act fast when you spot one. The music in Mouskattack is quite well done, but begins to seem a little long after 10 or 20 airings. It is compulsory, and so loses its appeal in short order. Still, Mouskattack has a lot of staying power as a maze game. 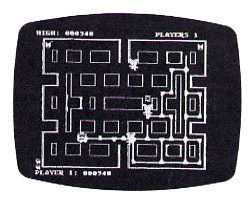 In addition to offering strategic potential, it offers a simultaneous two player game, wherein you play against rodent and opponent at the same time. Squeaking good fun!